Next-generation wireless access, or 5G, will provide innovative new experiences for consumers and will benefit industries across the economy. This new world of wireless will also rely heavily on fixed broadband provided by cable operators, who operate high-speed broadband networks and carry substantial broadband data, both wired and wirelessly. Realizing the 5G vision will also require technology standards, reliable security, plentiful access to spectrum, and robust investment. Next-generation wireless access, commonly known as 5G, is poised to rapidly advance communications and connectivity, with broad benefit to society. High-capacity connections will enable the movement of data at unprecedented rates. New applications that utilize these connections will enable novel experiences and new services. Proliferation of connected devices – and the data and insights they yield – will expand the capabilities of industries and governments alike. IHS, a market analysis firm, posits that 5G will become a general-purpose technology. Implemented at scale, it has the potential to enable other breakthrough innovations and seed broad-based economic advances. Wireless broadband has already changed the way we communicate. In the US, the number of wireless connections is greater than the population. Globally, there are nearly 5 billion mobile subscribers. Wireless access has enabled constant connectivity and has greatly expanded individuals’ access to knowledge and information via the Internet. 5G wireless will build on this success, and multiply it, by connecting new machines, systems, and infrastructure, all with capabilities in excess of what we know today. This development is occurring through the construction of new wireless technologies, systems, and devices. The vision for this work has been outlined by the International Telecommunications Union in what it describes as International Mobile Telecommunications system 2020 (IMT-2020), summarized in the figure below. As a leading provider of communications and entertainment, the cable industry is crucial to enabling these new wireless services and their broad potential for economic benefit. 5G wireless, using a mix of technologies and frequencies, will rely on tight integration with high-speed fixed broadband networks to carry data traffic. 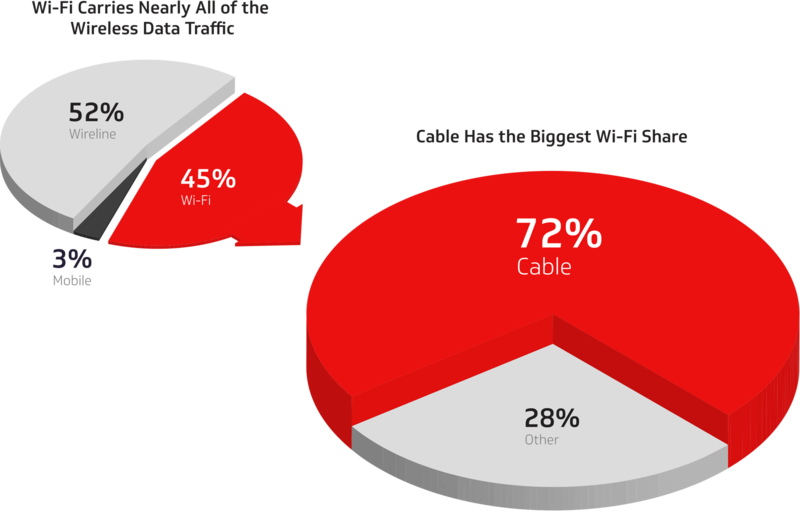 Cable networks are the most widely deployed in North America and Europe, and today cable operators carry the largest share of wireless data traffic, doing so over Wi-Fi. Cable is integral to consumers’ wireless experiences, and will continue to drive the development of wireless technology and services as we move toward 5G. While wide-area mobile networks are an essential feature of our communications landscape, the majority of broadband usage is not truly mobile. Rather, consumers primarily utilize content, applications, and services in a more nomadic or stationary fashion. For instance, the Broadband Stakeholder Group of the UK noted that the use of home and business broadband networks was significantly higher than the use of 4G networks. Sandvine notes that the dominant application category is streaming, in terms of data usage. And ABI Research estimates that 80% of all wireless traffic originates indoors. This phenomenon of higher-intensity wireless use in non-mobile environments is likely to continue as richer online experiences take advantage of even higher capacity wireless connections. Cable is therefore well positioned to enable 5G. Converged communications services are evident in cable today: Of CableLabs’ 55 members, nearly half offer mobile services. As technology continues to advance, this linkage between fixed and mobile networks will continue to grow. Cable operators have deployed vast broadband networks across the globe. 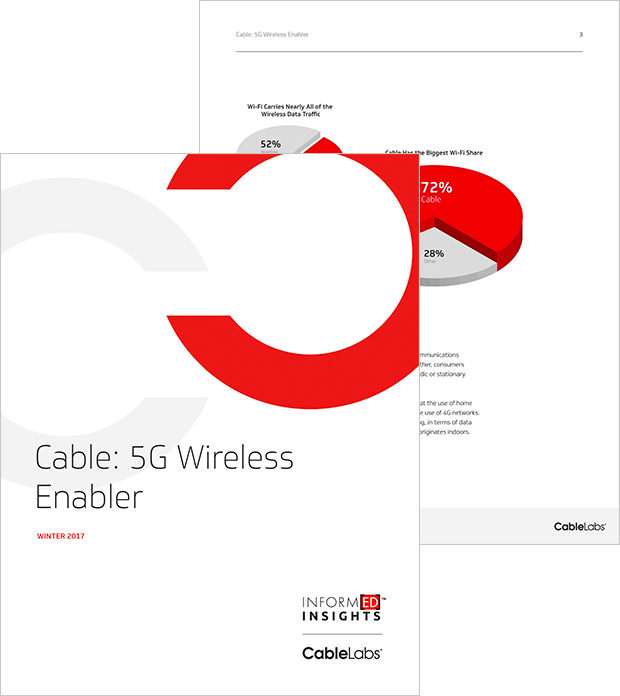 Since wireless services rely on fixed network connectivity, this positions cable to be a key enabler of 5G. Fixed and mobile broadband networks will continue to converge to provide multi-faceted seamless connectivity. In the United States, cable broadband now passes 93% of homes, far more than the coverage offered by high bitrate digital subscriber line (VDSL) technology and fiber-to-the-premise (FTTP). In Europe, cable passes nearly half of households, more than either VDSL or FTTP. Cable broadband networks will continue to grow. Ovum, a research firm, forecasts that global cable broadband subscriptions will rise from 137 million households in 2013 to 165 million in 2019. Cable technology is critical to Internet access across the globe, and is well suited to accommodate increasing Internet use. Current cable broadband technology is designed for speeds of a gigabit per second, and performance is set to grow by multiples as recent technological advances are deployed. The cable network is composed of a hybrid of optical fiber and coaxial cable elements, and the specification that enables use of the network for broadband is known as Data Over Cable Service Interface Specification, or DOCSIS®, which was developed and continues to be advanced by CableLabs and its members with the input of vendor technology partners. The most widely deployed generation of DOCSIS technology, known as 3.0, is capable of providing a gigabit per second (Gbps) of broadband capacity, and is deployed nearly ubiquitously across cable networks in North America and Europe. The newest generation of DOCSIS broadband, known as 3.1, provides a near-term path toward continued improvement of cable broadband performance, with network capacity up to 10 gigabits per second. Equipment vendors are now supplying the necessary components, and IHS expects that by April 2017 a third of global cable subscribers will have access to DOCSIS 3.1 technology. Cable broadband network innovation is continuing. In February 2016, CableLabs announced a program to incubate a technology that will enable fully symmetrical speeds, bringing upstream capacity on par with the 10 gigabit per second downstream capacity of DOCSIS 3.1 broadband. Known as Full Duplex DOCSIS 3.1, this technology can, if proven to be successful, enable a new range of use cases that may require significantly more upstream traffic than is typical today. The current capabilities and growth trajectory of cable broadband provides an important foundation for fixed-mobile network convergence. And the growing capabilities of wireless networks also enable this phenomenon. Already today, the large share of traffic from wireless devices carried over cable Wi-Fi, and the reliance of mobile networks on fixed infrastructure, point toward convergence in the connectivity marketplace. Indeed, there is evidence that consumers increasingly view broadband in a technology-agnostic manner. For instance, a 2015 Pew Research survey found that 13% of Americans have a smartphone but no home broadband – up from 8% in 2013. Next-generation wireless networks will rely on an integration (or aggregation) of different technologies, blurring the historic lines between fixed and mobile access. This evolution will provide even more broadband flexibility for consumers, and may shift competitive dynamics among service providers and change industry structures. Cable carries a significant share of wireless data today, and is positioned to enable 5G through continued advancement of broadband technology. Augmenting this trajectory is the wireless frequency composition of 5G technology. Next-generation wireless access will utilize spectrum bands that are higher in frequency than has been typical for mobile services to date. Higher-range frequencies offer the potential of greater bandwidth for improved network capacity, and they also entail reduced propagation range relative to lower frequencies. These physical properties lend toward small cell network architecture, with localized radio access points and abundant fixed network backhaul. Therefore, the shorter-range, higher-capacity physical properties of 5G necessitate tight integration with high-performing fixed networks. While organic trends and technology necessities position cable well for 5G, the industry is also proactively advancing technologies and systems that will benefit consumers in this new wireless world. To enable rapid near-term advances in the wireless experience, CableLabs is working to optimize Wi-Fi technologies and networks. Alongside our cable operator members and the broader ecosystem, CableLabs is driving greater consistency in performance of Wi-Fi equipment, and is standardizing features across the industry that will make the Wi-Fi experience seamless and consistently secure for consumers. CableLabs is also active in 3GPP, the mobile industry body that is working to implement the IMT-2020 vision of the ITU through the development of new radio technology for 5G. This work alongside global industry partners will bring to fruition the multi-gigabit, at-scale, diversified connectivity wireless future. In addition, cable is driving complementary technology developments that can bring new developments to an even larger population at a more rapid pace. CableLabs, Comcast, and Liberty Global are engaged in the MulteFire Alliance, which is modifying existing mobile standards to make them more broadly available, beyond traditional mobile operators. The dependence of 5G on access to new frequency bands will bring with it new models of spectrum access, including sharing of wireless frequencies between services and systems that were previously separate. This creates challenges of technology and governance, but also offers the potential for widely expanded broadband performance. CableLabs is on the leading edge of this work in spectrum sharing, with pioneering research to enable coexistence between Wi-Fi and LTE technologies, as well as new models of access that will enable sharing between mobile, satellite, and naval systems at 3.5 GHz. Innovation, research, and development in the area of spectrum sharing is essential to make the 5G vision a reality. To bring about advances in wireless broadband and attendant broad economic benefits, many diverse elements must come together. Technology standards are the building blocks for 5G, security of communications across a proliferating number of devices is essential, spectrum is a necessary input, and investment is crucial to development. 5G is, at its core, new wireless technology. This technology must be developed and standardized in order to enable the development of devices and networks at scale. 3GPP is developing new radio technology that is aimed at providing the features and benefits of 5G. IEEE is also developing technologies that will provide multi-gigabit broadband access. The MulteFire Alliance is adapting existing mobile technologies for broader adoption, and has similar ambitions for broadening 5G access. The Wi-Fi Alliance is optimizing current forms of access to enable rapid benefit to consumers. The work of these groups and its members, including CableLabs, forms the essential core of 5G. As wireless access expands to new devices and systems, and is used for broader purposes, security becomes ever more essential. Mission-critical services require security certainty. The proliferation of connected devices through the Internet of Things creates a greater number of vulnerability points. The security-by-design nature of broadband network technologies such as DOCSIS is well established. But the trajectory of 5G and IoT requires that security extend beyond the network, to devices, sensors, and systems. Industry-led IoT security efforts are occurring through the Open Connectivity Foundation (OCF), which was established in February 2016 to enable the market of connected devices through secure interoperability. To this end, OCF is developing an open specification to enable connected devices to securely communicate with one another regardless of manufacturer, operating system, chipset, or physical medium. The cable industry views security as fundamental to the growth of IoT and 5G. CableLabs and Comcast serve on the OCF board, CableLabs chairs its security work group, and CableLabs’ subsidiary, Kyrio, is a OCF-authorized certification test lab. Standardizing and certifying best practices in security throughout the broad ecosystem is a key to the growth of 5G and IoT. The growth of wireless broadband has strained the capacity of available spectrum. This trend has been well documented through periodic analyses and forecasts. In 2010, the Federal Communications Commission forecasted a looming deficit of mobile spectrum, based on factors such as broadband demand growth, technology advancement, and network investment trends. Brattle Group, an economic consultancy, updated this analysis in 2015 – following the release of additional spectrum for mobile – and found that additional spectrum would continue to be required through at least 2019 in order to satisfy demand. Similar analyses by CableLabs and Plum Consulting have concluded that the growth of Wi-Fi traffic and consumer usage is outpacing the ability of technology and investment to keep up, necessitating the designation of additional license-exempt spectrum by policymakers. Beyond addressing scarcity, spectrum policy must also account for new technologies. The latest Wi-Fi technologies and the planned specifications for 5G envision gigabit-per-second (and higher) connectivity, which is only possible with larger blocks of frequencies. Enabling next-generation wireless therefore means allocating large channels for flexible commercial uses. Doing so will require new approaches to sharing spectrum with existing systems – sharing dynamically in the geographic and time dimensions, moving beyond the historic means of sharing by dividing frequencies. The expansion in scope of spectrum sharing will draw in many new systems and operators. Therefore, new approaches to spectrum governance must be considered that align the incentives of diverse stakeholders toward the common goal of enabling continued growth of connectivity. Furthermore, 5G technologies are being developed as global standards, so spectrum regulators across the globe must work to provide ample common bandwidth and policy certainty that will enable the growth of 5G at scale. The development of 5G requires capital, both in the development of core technologies and in their deployment at scale. 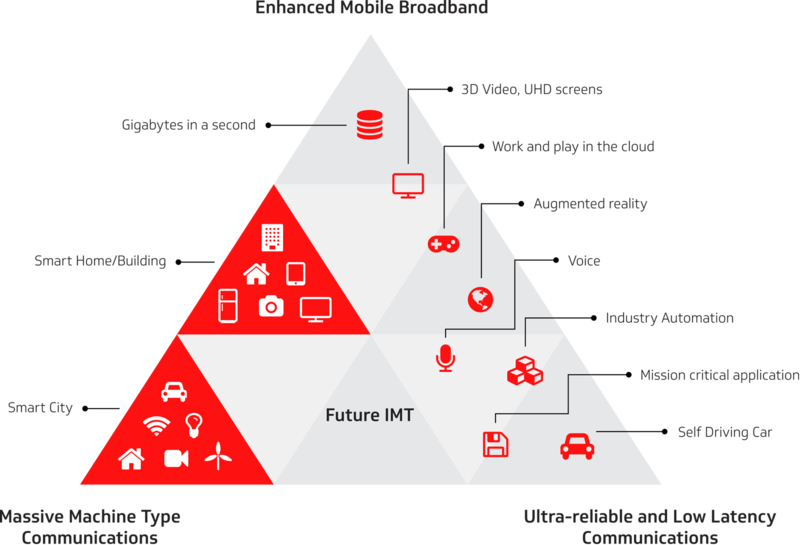 Relative to previous generations of mobile technology, 5G is anticipated to be broader in scope and in scale, with a greater emphasis on localized network capacity. These factors increase the investment required for deployment. In the US alone, the cable industry has invested $250 billion in capital over the past ten years, and now supports and estimated 2.7 million jobs. Continued investment in network capabilities will be necessary to enable 5G. GSMA estimates that operators will spend over $900 billion in the five-year period to 2020. This level of investment creates challenges of return, and requires new models of monetization as well as a public policy environment encourages creativity and capital. Wireless broadband has had a transformative effect on the way we communicate, and next-generation 5G wireless access will yield extensive benefits to connectivity and society at large. Cable networks carry a substantial share of wireless data traffic today, continued expansion of cable broadband capabilities both complements and enables the transition to 5G. The cable industry is progressing our 5G wireless future by driving essential technologies and systems. But cable will not do it alone. The realization of the 5G vision will also require broad-based technology and standardization throughout the ecosystem, reliable security, plentiful spectrum, and robust investment. IHS, “Biggest Trend among Cable Operators: Massive DOCSIS Deployments and a Shift to Remote/Distributed Access”, July 2015.